Perched on a brown branch with green and tan leaves, its “delicacy” enhances the over-all beauty of this particular example of BIRD POTTERY. 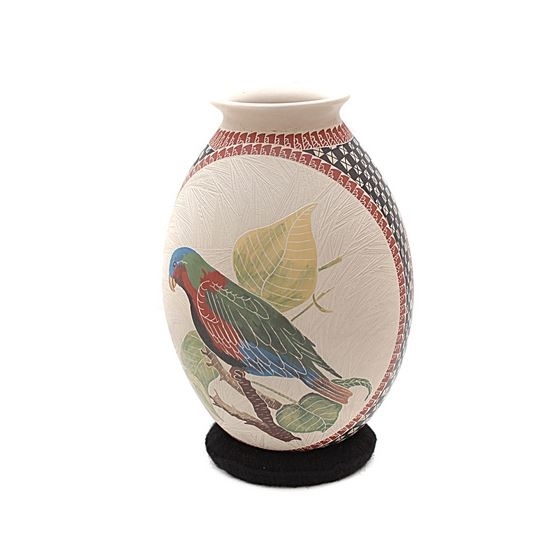 We here at www.wingsonthings.com are most pleased to be offering BIRD POTTERY for you to consider as part of your home decorating ideas. And, as BIRD POTTERY goes, there are few specimens more becoming than what we refer to as our “Humming Bird with Parrots” piece. The vase itself is shaped like an old-fashioned water pot - broad at the center and tapered at both ends. The rounding of its bottom necessitates the use of the cloth-covered ring that is included with the vase. What makes it so unique, and beautiful, however, are the fowl that adorn it. There are two “beige sides,” which are separated by black bands with diamond-shaped markings and rust colored bands. On one side is a delicately colored gray and tan humming bird “working” a green and rust colored flower. The other side of this piece of BIRD POTTERY features a parrot painted with muted blue/green and rust coloring. Perched on a brown branch with green and tan leaves, its “delicacy” enhances the over-all beauty of this particular example of BIRD POTTERY. If you are a birder, or just plain like bird decor, www.wingsonthings.com is a home décor website that you will want to visit frequently. And, if you are looking for something that we are not necessarily featuring, please let us know and we will do our utmost to find it for you!